menstrual cycle the regularly recurring physiologic changes in the endometrium that culminate in its shedding (menstruation). Menstrual cycles vary in length, with the average being about 28 days. 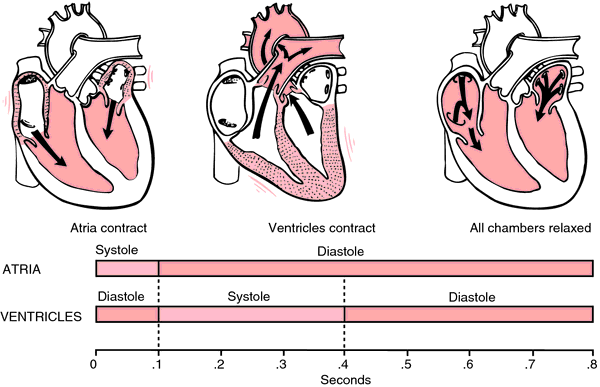 The length of time of menstrual flow is also variable, with an average of about 5 days. Women menstruate from puberty to menopause, except during pregnancy. The first 14 days of the cycle are called the follicular phase; a follicle containing an ovum is developing in one of the ovaries. It begins as the menstrual flow ceases; the lining of the uterus is stimulated by estrogen and begins to increase in thickness to prepare for the possibility of reproduction. On the twelfth or thirteenth day of the cycle, the ovulatory phase begins with a surge in levels of luteinizing hormone and follicle-stimulating hormone; ovulation then takes place and the ovary discharges the ovum. The ruptured follicle is transformed into a yellowish material called the corpus luteum; the luteal phase begins as the corpus luteum secretes progesterone. Progesterone acts on the endometrium, building up tissues with an enriched supply of blood to nourish the future embryo. If fertilization and conception do not take place, the estrogen level in the blood falls, the endometrium is no longer stimulated, and the uterus again becomes thinner. Blood circulation slows, blood vessels contract, and the menstrual phase begins; unused tissue breaks down into the bloody discharge known as menstruation. The cycle then starts again. Average 28-day menstrual cycle. The cycle begins when hormones from the pituitary gland stimulate the development of an egg in a follicle inside one of the ovaries. 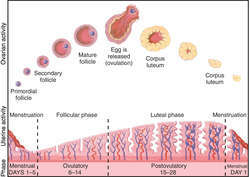 About the fourteenth day, ovulation occurs: The follicle bursts, and the egg is discharged from the ovary. If the egg is not fertilized, the cycle ends in menstruation on the twenty-eighth day. If the egg is fertilized, pregnancy begins. the period in which an ovum matures, is ovulated, and enters the uterine lumen through the fallopian tubes; ovarian hormonal secretions effect endometrial changes such that, if fertilization occurs, nidation will be possible; in the absence of fertilization, ovarian secretions wane, the endometrium sloughs, and menstruation begins; this cycle lasts an average of 28 days, with day 1 of the cycle designated as that day on which menstrual flow begins. Compare: endometrial menstrual cycle. the recurring cycle of change in the endometrium during which the decidual layer of the endometrium is shed, then regrows, proliferates, is maintained for several days, and is shed again at menstruation. The average length of the cycle, from the first day of bleeding of one cycle to the first of another, is 28 days. The duration and character vary greatly among women. Menstrual cycles begin at menarche and end with menopause. 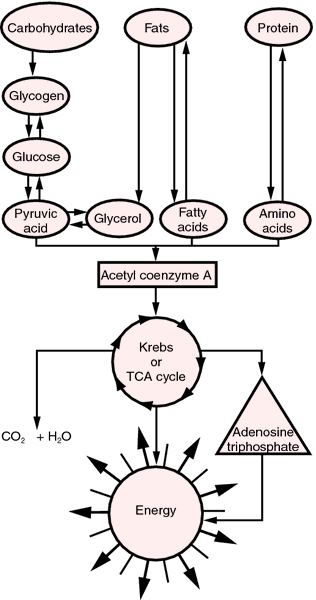 The uterine phases of the cycle are the menstrual phase, proliferative phase, and secretory phase. See also oogenesis. A monthly cycle that occurs in women from menarche (the first onset of menstruation) to menopause (the cessation of thereof), which is measured from the beginning of one menstrual period to the beginning of the next, ±28 days. The menstrual cycle is characterised by changes in hormone levels and physical changes in the endometrium, and prepares the latter for implantation of an embryo. The period in which an oocyte or ovum matures, is ovulated, and enters the uterine lumen through the uterine tube; ovarian hormonal secretions effect endometrial changes such that, if fertilization occurs, nidation will be possible; in the absence of fertilization, ovarian secretions wane, the endometrium sloughs, and menstruation begins; this cycle lasts an average of 28 days, with day 1 of the cycle designated as that day on which menstrual flow begins. 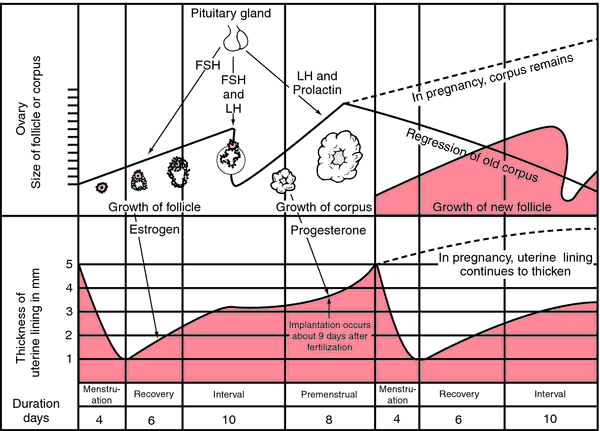 the modified OESTROUS CYCLE of most primates, which results in the periodic destruction of the mucosa of the uterine wall at the end of the LUTEAL PHASE. This results in a discharge of blood known as menstruation, the shedding of the ENDOMETRIUM, every 28 days in women. A hormonally regulated series of monthly events that occur during the reproductive years of the human female to ensure that the proper internal environment exists for fertilization, implantation, and development of a baby. Each month, a mature egg is released from the follicle of an ovary. If an egg is released, fertilized, and implanted, the lining of the uterus continues to build. If fertilization and/or implantation does not occur, the egg and all of the excess uterine lining are shed from the body during menstruation. in women, normally from the menarche to the menopause except when interrupted by pregnancy, the 4-week cycle under the control of pituitary and ovarian hormones, that ends with menstruation. The cycle appears to have little or no negative impact on women's athletic performance, despite the physiological changes that occur. Studies of O2 max during different phases of the cycle have shown no disadvantageous effect on performance despite subjective feelings of bloating and fatigue (seen with premenstrual syndrome) and the known effects of oestrogen and progesterone on oxygen utilization. Indeed, studies have shown that world records have been set during all phases of the menstrual cycle. See also amenorrhoea, female athletic triad. The period in which an oocyte matures, is ovulated, and enters the uterine lumen through the uterine tube; ovarian hormonal secretions effect endometrial changes such that, if fertilization occurs, nidation will be possible; in the absence of fertilization, ovarian secretions wane, the endometrium sloughs, and menstruation begins; this cycle lasts an average of 28 days, with day 1 of the cycle designated as that day on which menstrual flow begins. n a recurring cycle of change in the endometrium during which the decidual layer of the endometrium is shed, then regrows, proliferates, is maintained for several days, and is shed again at menstruation. The average length of the cycle is 28 days.